Making others green with envy, Johnny would tear up the twists and turns of the Great Alpine Road on the annual family holiday to the snow at Mount Hotham, Victoria. With the windows wound down and the rumble of the V8 echoing off the tall snow-topped trees, he’d smile all the way to the top. The 1970s was a very colourful decade in Australia, often referred to as the ‘psychedelic ‘70s’. With bright colours in fashion, lively music festivals like the Sunbury rock festival, the beginning of colour TV in our homes; it also led to vibrant hues being ordered by new car buyers. Contrasting and bright coloured stripes were eye catching and ensured a particular car stood out in the traffic. Our featured Green-Go Charger is a child of the ‘70s, stopping many in their tracks with its bright green paintwork and flamboyant stripes. Our story begins at Brown & Di Gioacchino Chrysler - a local garage workshop and Chrysler dealership which was located at 183 Watton Street Werribee, Victoria. The business was run by two men, David Brown and Carmine ‘Johnny’ Di Gioacchino. David ran the workshop and garage, whilst Johnny looked after sales and customer service. Johnny would get around town in his blue VH 770 Charger V8, and was also known as the go-to guy if you wanted a great deal on a new car. One day, the local dentist visited the dealership interested in buying a new car. “The dentist came to buy a car, and told me he wanted a blue Charger” recalls Johnny. “Not any blue Charger, he wanted MY blue Charger!” not wanting to miss a sale, a deal was done. A replacement car didn’t take long to arrive “I was always driving new cars but I missed my old car. I ordered the Green-Go Charger and I was going to keep that one”. Johnny’s Green-Go VJ Charger was built on Thursday 5th September, 1974. It was ordered with the A54 Sports Pack option which equipped the car with the ‘Regal’ instrument cluster, 3-spoke sports steering wheel, and the painted body stripe. Johnny really liked the green with the white and red stripe, but the part of the car he loved the most, was the 318cid V8. There wasn’t a huge difference between the VH and VJ Charger overall, though most recognisable was the change from rectangular headlights to 7-inch round headlights. Johnny would take his family on an annual trip to the snow in the Victorian alpine region. They visited Mt Buller and Falls Creek, but their favourite destination was Mt Hotham. “Driving up the mountain to the snow, I used to drive with the windows wound down just to listen to the noise. Everyone else in the car would be freezing, but I didn’t mind”, he laughs. The family would travel with a group of friends (about four cars) and would top up their fuel in the township of Bright. Johnny recalls that his Charger always seemed to take $1.00 less fuel than everyone else’s car, despite being the only V8 in the group. Back then, a dollar bought a lot of fuel. After nearly 12 years of ownership, a dozen family trips to the snow and around 60,000kms travelled, it was time to sell the Charger. Johnny had a regular customer to the workshop who was always asking about the Green-Go Charger. After discussing the finer details they, agreed on a price, and Johnny’s pride and joy was sold. He received more than double what a Charger was going for back then. Unfortunately, the second owner of the Green-Go Charger has passed away. Previous registration papers reveal that the car spent some time in central regional Victoria, though his immediate family was unable to be contacted despite our best attempts. Paul has been interested in cars for as long as he can remember. When he was six years old his older brother owned a blue Holden HK Monaro327. His father also owned some interesting cars including a ZB Fairlane, an XR Fairmont V8, and a Ford Galaxie 390 (pictured) Paul’s first car was a lime green Holden Torana LC XU-1, which he bought in 1983 for just $3,000. 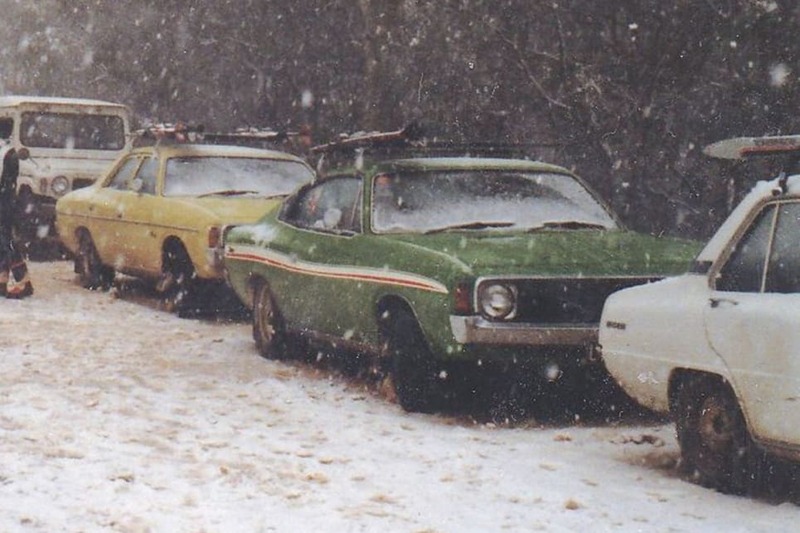 His mother also had a green Holden HR Special, so having a green machine was not unusual. If you’re lucky, you might just see Paul and his Charger at a car show around Melbourne, but only when the weather is right. He enjoys sharing his Green-Go Survivor with enthusiasts, who are staggered when he tells them it has not been restored. Almost like a time machine, all you have to do is hop in to this car and turn the key, and it will take you right back to the psychedelic ‘70s. Though this time machine isn’t a fantasy, it is a reality that will continue to be preserved and enjoyed for many years to come.